Why Use A High Level Language For DSP ? The field of Digital Signal Processing is constantly pushing the price / performance envelope of technology and traditionally this has required systems developers to use assembly language for the majority of the time critical signal processing routines. Today's commercial pressures have moved the "goal-posts" dramatically and typical project development timescales require a larger part of the application to be developed using a high level language. Another benefit to using a high level language for the system development is that a system can be rapidly prototyped to prove the algorithms and then hand optimised using assembly code for the time critical areas. The latest generation of compilers allows high level code to be compiled to a quality of assembly code that is very close to that which would be generated by hand. The development process is therefore very much easier than writing the algorithm in assembly code from scratch. An increasingly common development route is to develop the algorithms on a PC or Workstation and then rewrite the application for the target processor. Using the same language for development and deployment often allows the same code to be used for both, with the different I/O requirements handled through the use of conditional compilation of the source. Modern high performance DSPs are also changing the way we view algorithmic efficiency and an increasing number of projects are written in a high level language because the savings at development time are far greater than the extra cost overhead of using faster processors at deployment.The architectures of the latest DSPs are also becoming more complex, for example with the integration of parallel execution units. This means that it is increasingly difficult for programmers to learn how to fully optimise their algorithms. When the complexity issue is coupled with the fact that the majority of DSP algorithms are block oriented vector processing algorithms and it is now becoming possible for high level language compilers to produce code that is 100% optimised. The Zoom-FFT is a process where an input signal is mixed down to baseband and then decimated, prior to passing it into a standard FFT. The advantage is for example that if you have a sample rate of 10 MHz and require at least 10Hz resolution over a small frequency band (say 1 KHz) then you do not need a 1 Mega point FFT, just decimate by a factor of 4096 and use a 256 point FFT which is obviously quicker. One common question is : Is the zoom FFT the same as the chirp z-transform. The answer is : Absolutely not. The FFT calculates the FFT at N equally spaced points around the unit circle in the z-plane, the chirp z-transform modifies the locations of these points along a contour that can lie anywhere on the z-plane. In contrast, the zoom-FFT uses digital down conversion techniques to localise the standard FFT to a narrow band of frequencies that are centered on a higher frequency. The chirp z-transform is often used to analyze signals such as speech, that have certain frequency domain charactgeristics. The zoom-FFT is used to reduce the sample rate required when analysing narrowband signals - E.G. in HF communications. These functions, and more, are available in the SigLib DSP Library. Modulated signals are often scrambled when they are modulated. There are many reasons for scrambling the signal, including : spreading the spectrum and reducing the correlation between separate channels. Most scramblers utilise a Maximum Length Pseudo-Random Binary Sequence (MLPRBS or MLS), this uses a shift register an exclusive-or gates to randomise the data, as shown in the following diagrams. There are two general arrangements for implementing a scrambler, the non-synchronising and the self-synchronising types, each has its own benefits and draw backs, the non-synchronising type requires that the transmitter and receiver are synchronised before data transmission starts however once synchronised an input bit error to the receive scrambler will cause a single bit error in the output. The self-synchronising scrambler(shown below), as the name suggests will automatically synchronise to the received bit stream but a single receive bit error will cause N+1 bit errors in the output stream, where N is the length of the shift register. This algorithm is included in the SigLib DSP Library. One-pole filters are very useful and efficient techniques for filtering signals. The feedback a value can also be used to design efficient peak-hold filters in the time-domain and are also used in power spectrum analysers and can help extract features of the signals that we are analyzing. The most common adaptive filters are of the FIR type, particularly the Least Mean Square (LMS) adaptive filter. Many applications require the detection of a few discrete sinusoids. The Goertzel filter is an IIR filter that uses the feedback to generate a very high Q bandpass filter where the coefficients are easily generated from the required centre frequency, according to the following equations. The most common configuration for using this technique is to measure the signal energy before and after the filter and to compare the two. If the energies are similar then the input signal is centred in the pass-band, if the output energy is significantly lower than the input energy then the signal is outside the pass band. The Goertzel algorithm is most commonly implemented as a second order recursive IIR filter, as shown below. A common and very efficient technique for envelope detection is based on the Hilbert Transform, (a 90 degree phase shifter) and summing the phase shifted and original signals. The Hilbert transform is typically implemented as an FIR filter so the original signal must be delayed to match the group delay of the Hilbert transform. This process can be followed by absolute and then peak hold functions, the latter is often implemented as a one pole IIR filter. The following diagrams give an idea of how this envelope approximation process works. The following equation shows how the coefficients of the FIR filter implementation of the Hilbert transform are calculated. In general, this will give similar results to the absolute value technique but can be more run-time efficient. Many of the IP connected applications I have written need to support both Windows and Unix/Linux. There are some minor differences between the two socket APIs but these are primarily related to configuration. Once the code has been configured the vast majority of the code will be the same for both operating systems. Here are versions of the code included in the above URL, that compile on both Windows and Linux. I am often asked how I debug real-time and DSP functions. Here is a summary of what works for me. While there are solutions for displaying signal data graphically, which we will discuss later, I often find that I need to log precise values so that I can check for single bit errors etc. To this end, printf is a pretty good solution but I find that a better one is to use fprintf to log the data to files, this way the tests can be automated and it is easy to use file comparison tools, like KDiff3, or python to check for differences between successive runs. and then use conditional compilation. Next, I will use fprintf to send the results to a log file, called debug.log. One of the most common problems with these functions is how to include them in real-time applications without breaking the response time requirements. JTAG is horrendously slow for this requirement but on my favourite XMOS microcontrollers the debug data can be sent back to the development workstation using a parallel data path, called xSCOPE, in real-time - https://www.xmos.com/products/tools/xscope. xSCOPE uses the xCONNECT data path to route the data with very little overhead on the application being debugged. To display data graphically I will typically use Gnuplot, as I documented in this blog post http://realgonegeek.blogspot.co.uk/2014/01/interfacing-cc-to-gnuplot.html, or the XMOS xSCOPE graphical display in xTIMEcomposer. 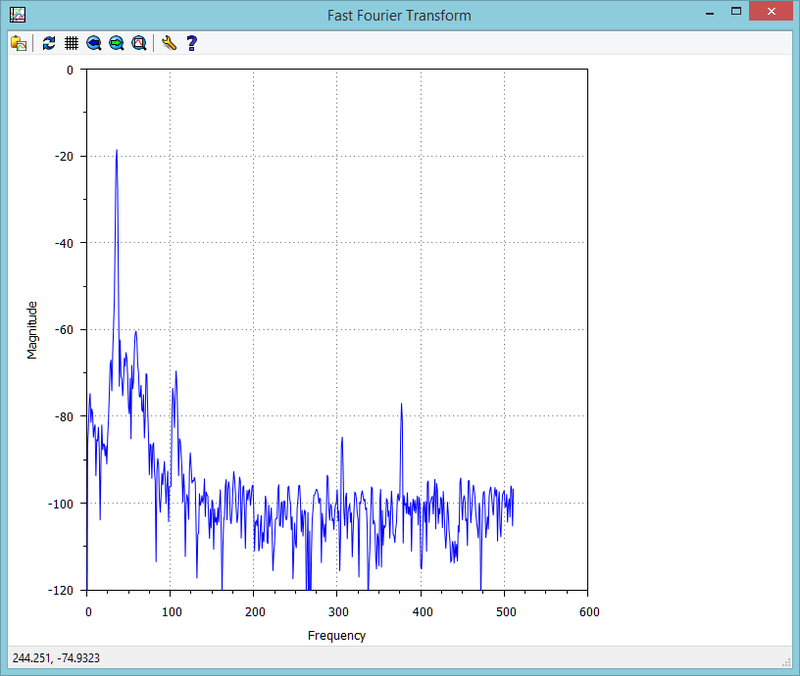 In this example we are going to use the SigLib DSP Library functions to perform a Fast Fourier Transform on the Analog inputs on our laptop or desktop computer. We can use the free version of SigLib (no source code) from here : http://www.numerix-dsp.com/free/. That SigLib is installed and configured correctly for your compiler. Full details are included in the SigLib User's Guide which is provided with the library and also available here : http://www.numerix-dsp.com/docs/. That GnuPlot and Gnuplot/C are both installed and working correctly : http://realgonegeek.blogspot.co.uk/search?q=gnuplot. The code uses a double buffering technique so that the analog input code writes the data into a separate array to the one being processed with the FFT functions. The global variables are decalared as volatile. This prevents the compiler optimizing away the code, which often happens when variables are used in interrupt service routines because the compiler has no way of knowing how the ISR is going to be called. GCC and some other compilers do not implement the kbhit () function so I have included the code from here : http://cboard.cprogramming.com/linux-programming/51531-faq-cached-input-mygetch.html#post357655. 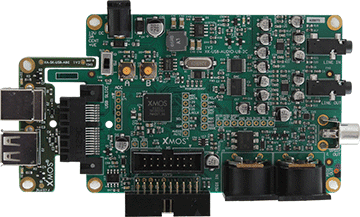 The XMOS xCORE processor on this board is more than capable of handling the signal processing code shown in this blog but for the purposes of the demonstration I am running the DSP code on the host.